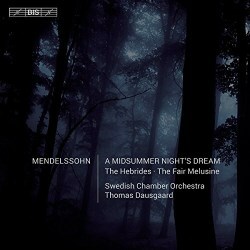 At the core of this disc is the glorious incidental music Mendelssohn wrote for Shakespeare’s A Midsummer Night’s Dream. It is extraordinary that the overture, itself a masterpiece, was written when the composer was seventeen years old, and that the remainder of the music was then written no less than seventeen years later, for a performance of the play in Potsdam. It is full of treasures, including the famous Scherzo and Nocturne, as well as the Intermezzo depicting Hermia distractedly searching for her Lysander. The high point, for me, is the song for soprano and women’s voices ‘Ye spotted snakes’, which Camilla Tilling sings to perfection. The way she throws off her pianissimo high A in each verse is a total joy. The engineers have done a splendid job here, finding the exact right balance between soloists, women’s voices and orchestra. The music is fascinating, and so daring in its harmonies and textures. Take one example, No.4 on track 6, simply called ‘Oberon tritt auf’ – ‘Oberon appears’. A spare, extremely soft line for unaccompanied violins that could almost be the beginning of a Schönberg tone-row, interrupted by little bursts of ‘fairy music’; just forty-eight seconds long but powerfully evocative. There are other moments of similarly magical description that Wagner would have been well advised to take note of when preparing to compose The Ring - and he may well have done just that. I’ve already mentioned Camilla Tilling, the Swedish soprano, who has to be one of the finest around today. Thomas Dausgaard achieves outstandingly alert playing from the Swedish Chamber Orchestra, who characterise everything so well, whether it’s the music for the supernatural characters, the lovers, or the ‘rude mechanicals’. The disc begins with a delightful performance of the concert overture known in this country as ‘The Fair Melusine’, capturing both the flowing lyricism of the slower music and the driving energy of the quicker episodes. I wasn’t so happy with the final item, the famous ‘Hebrides’ overture. There are more recordings of this piece than you could shake several bundles of sticks at but this one is simply too fast. It’s the northern isles viewed from a jet-ski. Mendelssohn is quite clear in his tempo indication – Allegro moderato, meaning moderately quick. Mendelssohn wrote plenty of seriously fast music, so we can assume the adverb ‘moderately’ is important. The playing is excellent, but the music sounds so rushed that the sense of space and grandeur is lost. There also seems to be something missing in bars 7-8, namely the important line in lower strings and bassoon; possibly an editing error? Furthermore, the generally quick tempo means that the coda, where Mendelssohn really lets rip, doesn’t have quite the impact it should. Well, that is just track 26; most people will already have a recording of 'The Hebrides', and the other 25 tracks are excellent, so don’t be put off - this CD is stuffed with wonderful things.